Amy Coney Barett has youth, conservative cred, and Roe v. Wade bias. She’s also picture-perfect: Happily married Mom with seven kids, two of whom were adopted. A conservative woman in the court could help counter some of the accusations of gender-bias in some of the SCOTUS decisions. Barett has a comendable scholastic background, but she has absolutely no real experience in the courts. She only took her court seat in November, 2017, not long enough to have built up any kind of credibility. Not long enough to have established an understanding of how she might decide on key issues. Conservative pundits say one favor in Barett’s favor is that some Democrats voted for her confirmation and it would be difficult for them to back out now. On the contrary, it would be extremely easy for Democrats to withhold support for Barett: voting for someone to join a circuit court doesn’t require that person to have previous court experience. Requirements for SCOTUS are, and should be, different. In addition, though anti-choice voices point out her reliability when it comes to a vote on Roe v. Wade because of her strongly religious background, other pundits must be aware that if the Catholic church is reliably anti-choice and anti-LBGTQ rights, it’s also interested in social justice reform, pro-immigrant, and for the environment. The few cases that Barett participated on in the 7th Circuit don’t provide a clear idea of how she would decide on key environmental or immigration decisions. If we’re going to judge Barett based on beliefs rather than legal perspective, ask yourself whether a mother of seven, two of whom are adopted from Haiti, would support Trump ripping babies away from mothers at the border? If you’re going to use Barrett’s religion as a litmus test, you have to embrace all beliefs of that religion. The leanings we who would prefer a balanced court consider to be positive, conservatives would consider anathema. Other drawbacks to Barett’s selection include the law school she attended (not Harvard, not Yale), and her membership in People of Praise. It’s been termed a ‘cult’, but there’s nothing to really substantiate this, because many of the stated goals for the group don’t differ all that much for many other strongly religious groups in the country. Regardless, membership in the group will work against Barett. The group will figure into the discussion on any decision she makes. Again, Trump is highly influenced by media perception of his decisions, and People of Praise is guaranteed to be media fodder for years to come. The Washington Post called Raymond Kethledge Gorsuch 2.0. He’s reliably conservative in his decisions, and has had enough experience in the court system for people to get a good idea of how he’d rule on contentious issues. He also clerked for Kennedy, and his inclusion in a short list would surely reassure Kennedy that he could safely retire. One advantage for Kethledge may also work against him: he went to Michigan Law rather than Yale or Harvard. He would add academic diversity, but this doesn’t necessarily appeal to Trump, who is all about brand names. Kethledge isn’t as young as Barett, but he’s close. At 51, he could serve on the court for decades. He’s also a favorite among the conservative pundits, most of whom consider him a dedicated textualist. This means he doesn’t believe the meaning of the Constitution changes over time, and that judges can’t determine the collective ‘intent’ of the text. Scalia was a well-known textualist. Kavanaugh was another Kennedy clerk, a mark in his favor. However, the biggest drawback he faces is the fact that he has a close connection, directly and via his wife, with the Bush family. In his favor, Kavanaugh also has the most impressive judicial background in the second most important court in the land: the U. S. Court of Appeals for the District of Columbia. However, potentially this can work against him if Trump considers Kavanaugh to be too much of a Washington insider. Still, if Trump is going for the ‘full package‘, Kavanaugh is that, with a bow on top. He’s a little older at 53, but healthy and there’s no reason to assume he couldn’t influence the court for three decades, if not longer. Kavanaugh is also a strict textualist and reliably conservative. More importantly from a Trump perspective is that Kavanaugh has most frequently ruled against EPA regulations in the administrative law cases he’s heard. He could effectively join with Gorsuch and have a profound and lasting impact on environmental regulations for decades. The SCOTUS impact on the environment is frequently ignored in favor of Roe v. Wade in the discussions about the SCOTUS pick, but it is the environment that is most vulnerable. The environment, LGBTQ and voting rights, immigration, and our regulatory system are all much more vulnerable than Roe v. Wade. Kavanaugh is my best guess for a Trump pick for all of the above reasons and for two others: Kavanaugh’s membership of the team that investigated Bill Clinton, and his membership in the DC circuit court. Diving into Trump’s mind, I can see him relishing the the mention of Starr’s investigation of Clinton occurring, again and again and again, in Kavanaugh’s hearings and in the press while the hearings are ongoing. Remember that Trump frequently fixates on minutia over the bigger picture. Also remember that Trump has a capacity for pettiness that can be breathtaking at times. And this leads to the second reason why I feel Kavanaugh will be Trump’s pick: his taking over the vacant SCOTUS position would free up a position in the Appeals Court for the DC circuit, the second most important court in the land. Better known as the court currently headed up by Merrick Garland, Obama’s pick for the SCOTUS seat stolen from him. Trump could see appointing Kavanaugh to SCOTUS as not only freeing up a position on the second most important court—a new feather in his judicial cap—but would provide him a second opportunity to have a mark on the court that Garland leads (the first was the appointment of Gregory Katsas). Again, remembering his fixations and his capacity for pettiness, appointing a new justice to Garland’s court would be another way to thumb his nose at Obama. Appointing Kavanaugh to SCOTUS would also give Trump two seats he would perceive that he ‘owns’, on a court that frequently rules on cases having to do with the federal government and regulations. Regulations that Obama’s administration created and that Trump has fanatically sought to overrule since he took office. Of course, any guess as to the SCOTUS pick is just that: a guess. As we’ve come to sadly realize over his tenure, Trump frequently makes his own decisions irrespective of any advice from those around him, and he does so based on whatever whim hits him at the moment. It’s just unfortunate that Trump’s whim will have a profound impact on our country for decades to come. Elections have consequences. * Some media sources also mention that he narrowed the choice down to four, and others said seven. 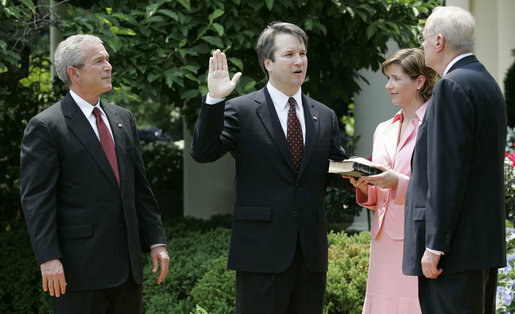 SCOTUSBlog has narrowed the list to five, and provides an in-depth review of each. Of course in Trump’s land, anyone can end up being a candidate. Who knows the workings of his mind.